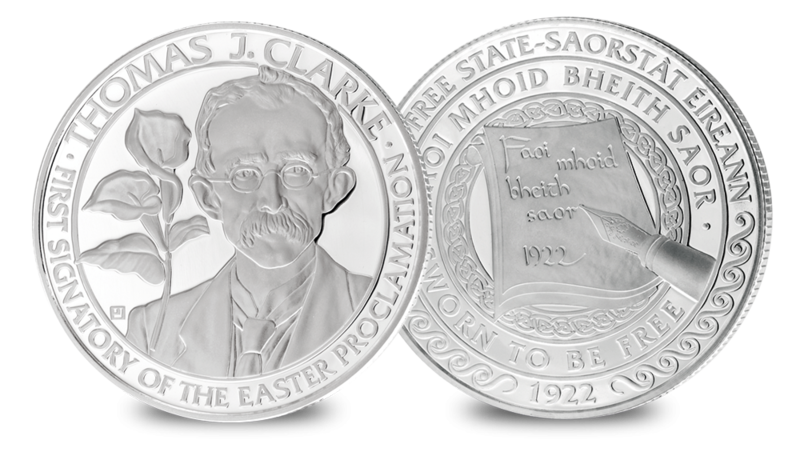 The Thomas Clarke medal is part of the seven signatories set which includes seven portraits of Irish Heroes. Each medal depicts the portrait of one of the Seven Signatories, together with their name and a fitting individual inscription. The commemoratives all share a common reverse design inspired by ‘Amhran na bhFiann’ (‘A Soldiers Song’), which was first coined during the Easter Rising and then adopted as the national anthem of the Irish Free State in 1926. One of the prime strategists of the Easter Rising, Thomas Clarke spent the whole of his adult life agitating and fighting for the republican cause. He was the very first ‘Signatory of the Easter Proclamation’ and would have been the nominated President of the new Irish Republican had the rebellion succeeded. Clarke is featured with the Easter Rising Lily, a symbol of remembrance in memory of those who gave their lives in the fight for Irish independence.